Types of Art: The Ekoi-speaking peoples (Anyang, Boki, Ejagham, Keaka, and Yako) are best known for their large, skin-covered masks, which may have one, two or even three faces, and for their smaller headpieces, which represent a head or an entire figure. 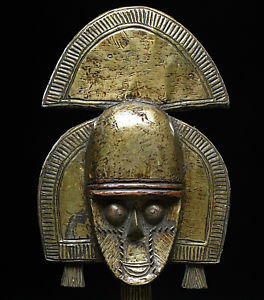 The heads and skin-covered helmet-masks are unique in Africa. Earlier skins of slaves, later skins of antelopes, were used. The elaborate trading network along the river formerly involved the selling of rights to Ngbe and other associations, including the right to perform their various masquerades. The group selling the rights would perform the masquerade in the village of the buyer group, then return home, leaving their masks and costumes behind. The river trade thus helped to spread related art events and art objects among diverse people over a broad area, though changes in both form and meaning took place as local copies of masks and costumes were made. Masks of secret societies appear in performances by accomplished dancers at funerals, initiations of new members, agricultural and other events. Two types of masks dominate: helmet masks and crest masks. The helmet mask covers the entire head of the wearer reaching to the shoulders. When the mask is made fresh animal skin is stretched and tacked over the soft wood from which it is carved. After the skin dried, it was stained with pigments made from leaves and bark. Crest masks do not cover the head but rather sit on top of it. They are attached to the basketry cap, which is held on the wearer�s head. The headpieces and masks often have metal teeth, inlaid eyes, and frequently pegs to represent hair, which, alternatively, may be carved in elaborate coils. Feathers, quills, and other objects would have ornamented the mask in performance. Human hair went into the hairdo. It is presumed that all masks represented ancestors. In addition to masks that represent human heads, there are also those that represent skulls and animals. All of these animal masks and grotesque masks are seen as fierce and frightening. The skin covering of a mask served as a magical agent to invoke ancestral spirits, thus eroding the barrier between living and dead participants in communal rituals. Religion: The primary traditional Ekoi deities are Obassi Osaw, the sky god, and Obassi Nsi, the earth god, similar to the Efik. Ancestors and natural forces are also emphasized in Ekoi worship. Various Ekoi cults are devoted to the welfare of common activities, such as farming. Before the establishment of British colonial administration, the egbo was a prominent Ekoi secret society that had strong social regulatory functions as well as influence in religious matters. Members of the egbo used a form of ideographic writing called nsibidi, variations of which were formerly found among other ethnic groups in southeastern Nigeria.